It can be tricky to know exactly how you should be disposing of certain things in your home—Do you recycle it? Throw it in the trash? Flush it? Put it through the disposal? 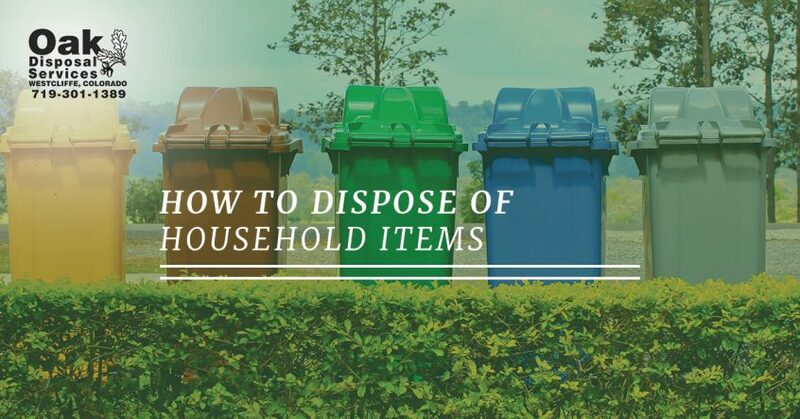 There are a lot of choices, but you’ll want to make sure you’re disposing of things properly to prevent slow-downs or unnecessary work for disposal companies. Additionally, disposing of things properly will lead to a healthier and safer world which is great for all of us! If you’re ever struggling to determine the best way to dispose of something, you should first check the label of the item you’re trying to dispose of. If there are no disposal instructions, you should contact your local Household Hazardous Waste disposal center to see if they accept it or ask for advice on disposing of it safely. Believe it or not, water-based and latex paint can be disposed of in a regular household trash can, as long as they’re dried out first. If you need to dry a large amount of paint, try combining it with litter, sand, or other absorbent material that will help it dry faster. On the other hand, oil-based paint is a household hazardous waste (HHW) and you should take it to your local HHW facility for disposal. Never throw these paints directly in the trash, even if they are dry. Some, but not all medication can be disposed of in the toilet or trash, however, there are much better alternatives to this. Some programs are in place as “take-backs” for unused and out of date medications and you should check your local law enforcement agency’s website. If you aren’t able to wait for the next pickup day in your neighborhood, you should add water to the medication container and put it in a plastic bag full of sawdust, coffee grounds, or anything unpalatable. The best way to dispose of chemicals and household cleaning supplies is to find someone to use them, or give them to someone who can. If this isn’t an option, most cleaners can be mixed with water and dumped down the drain. For other, more specialized compounds, check the label or contact an HHW center to see if they’ll take them. Disposing of old VHS tapes and movies can also be a struggle. Many people will throw these in the trash, not realizing that it is a potential hazard. The first thing you should try is passing them onto someone else by either selling them in a garage sale or taking them to a donation center like Goodwill. If this doesn’t work out, you should take them to your local dump for disposal. The most common question people having when disposing of household items is, “where do I dispose of my used batteries?” It can be complicated, so it’s no wonder so many people struggle with it. If you have a rechargeable battery that you need to get rid of, take it to Best Buy or a local waste facility. Many electronics stores will take used batteries, cell phone batteries, and other tech as long as it’s under 10 pounds. If you have any problems with waste disposal or recycling, don’t hesitate to contact Oak Disposal Services today! Our highest priority is to keep our community safe and give you waste disposal options that are convenient for you and don’t leave you wondering whether you’ve disposed of something properly. We have residential and commercial trash pickup, construction cleanup, portable toilets, and recycling, so don’t hesitate to contact us if you have any questions! 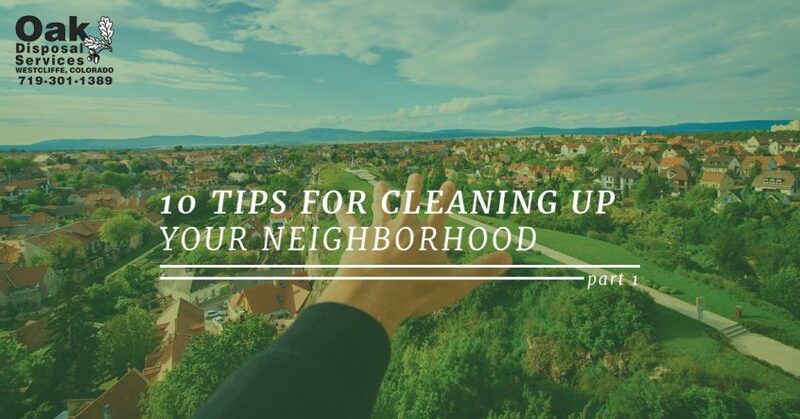 Taking the initiative to clean up your neighborhood can be difficult, but in the long-run, you’ll be proud of your accomplishments and you’ll have a more happy and healthy community because of it! In this blog, we’re going to talk about a couple ways you can make your neighborhood clean and pollution free. The only way to know the problems that your neighborhood is facing is to walk through it and observe it for yourself. Look for trash on the ground, pollution in streams or ponds, and be aware of any strange odors. However, not all environmental issues can be observed, so it’s important that you contact a community authority to see if there is anything you can do to help. The number one way to start cleaning up your neighborhood is to lead by example. If you’re doing your part, you will have an easier time getting others to follow. One great way to show people you care is to clean up your own yard. We’ve all had that neighbor who stores junk in their backyard. Don’t be this person! If you show that you care about how your yard looks, others will follow. You may even initiate a little friendly competition to see who has the nicest yard! If you want to completely eliminate litter in your neighborhood, you’ll want to make sure that your trash is always properly secured. Never overfill your trash can. If you consistently fill your garbage bins, you should invest in another one, or wait until the next trash cycle before you put it out to the curb. If other people in your neighborhood have problems with this, make sure you let them know or teach them to secure their trash better. Another way to create a clean neighborhood is to be part of a community cleanup project. In many communities, cleanup projects are hosted through recreation centers, at parks or throughout neighborhoods. This is a good way to help out and meet like-minded people who may be interested in helping you with some projects of your own. Riding your bike rather than driving to work every day is a great way to reduce carbon emissions as well as set an example for everyone else in your neighborhood. Once your neighbors find out about this, you will most likely be the talk of the neighborhood because riding a bike to work is usually something that people talk about, but never end up doing. Sometimes creating a clean and healthy neighborhood just means having the right waste disposal service. Oak Disposal is dedicated to keeping your neighborhood a clean and healthy place for everyone to live. We offer residential trash service, porta potty rentals, and commercial dumpster rental, so contact us today! 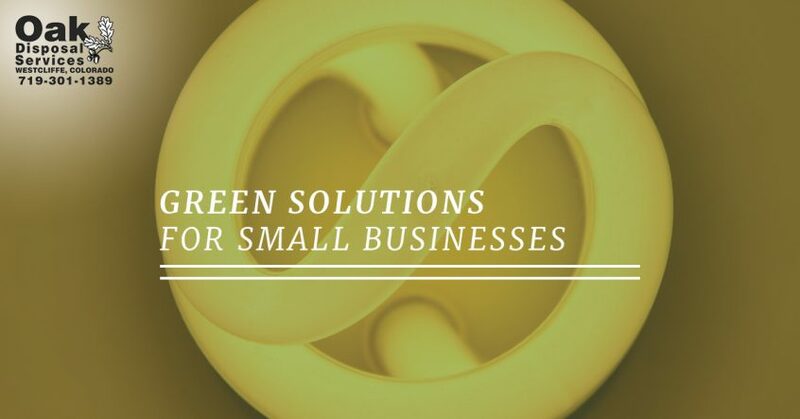 Do you run a small business and want some ways to become a more green company? Having a more environmentally conscious company is not only best for the greater good, but it can also increase your brand’s appeal. A lot of people don’t hop on this bandwagon because they see it as more of a fad or a scam than anything else. However, if you’re actually making the effort to change your company and prove it to your customers, it will be a benefit to everyone! In this blog, we’re going to talk about a couple things you can start doing for your business that will make it more environmentally friendly. Although standard bulbs are cheaper, they’re not as easy on the environment. Switching to LED means more efficient energy consumption, less heat production, and no toxic gases like mercury to deal with. Another thing you can do is add motion sensors to break rooms and bathrooms. This way, you won’t have to worry about someone leaving a light on overnight. If a lot of your employees live nearby, try to encourage them to find alternative modes of transportation. A great way to do this would be to create a company-wide bike-to-work day or hand out flyers encouraging employees to carpool if they live close to each other. These are all great ways to make your employees more environmentally conscious, and open the door to similar opportunities. Creating banners or posters to hang in your office is a great way to liven it up while at the same time, reminding people to help the environment. Try figuring out a method for tracking how much energy you’re saving, how many cans you’ve recycled, or how much natural gas you’ve saved by biking. People are more likely to take action if they can see that their hard work is actually paying off and helping the environment. You should also set company goals that will give your employees more of an incentive to work towards making your company environmentally friendly. Being environmentally friendly is great, but it’s all for naught if you’re spending money on companies that aren’t. If you pay for transportation services, office supplies, or anything else that supports your company, make sure these businesses are working towards the same environmental goals that you are. Supporting local businesses will not only help cut down on transportation costs and carbon emissions, but it will help your community. Now that you’ve created an eco-friendly business, you’ll want to show it off. You’ll want to rebrand your company to show-off all the success you’ve had. Not only will this increase the appeal of your company, but it will encourage others to do the same. If you’re ready to make your company eco-friendly, Oak Disposal is here for you! Contact us today to learn more about our waste services in Westcliffe! In our blogs, we’ve talked a lot about residential and commercial trash clean up and the benefits to our community and the world. However, what’s the importance of keeping our water sources free from debris and contamination? There’s a lot more to it than just making a water source look nice, and cleaning them will help every living being on the planet, not just fish. 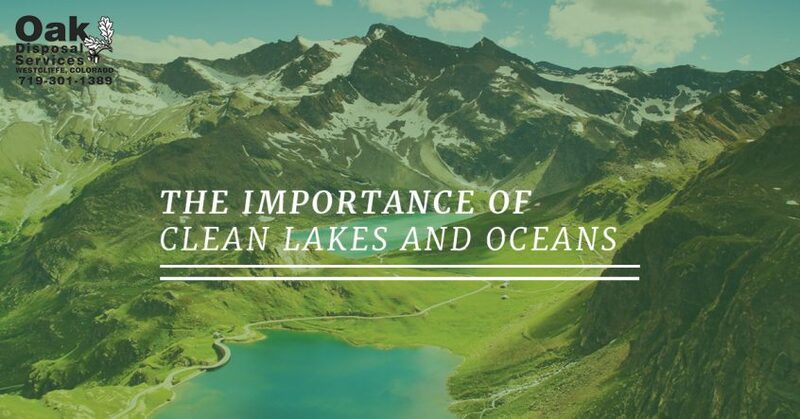 In this blog, we’ll talk about just some of the many reasons we all have an obligation to keep our lakes and oceans clean. As adults, many of us have fond memories of spending time at a lake or on the beach. Even if we don’t live near a major water source, we’ve all taken vacations to relax in the sun and play in the water. Maybe it’s so mesmerizing to us because it’s so different from the environment we live in on a daily basis. Although lakes and oceans are completely different ecosystems, it doesn’t mean that they don’t face some of the same issues as we do in our ecosystem. When it comes to waste, both humans and sea life are affected by its intrusiveness. Have you ever gone to the beach looking for the perfect place to hang out only to find that it’s covered in trash? Or have you gone out for a lake day with your friends, only to realize that you aren’t allowed to swim because of how polluted it is? However, this issue is affecting other animals a lot more than it’s affecting us. If we over-pollute one area, we have the ability to move to another. On the other hand, for fish and other animals that depend on lakes and oceans, it’s not that simple. When a fish or marine mammal encounters debris in the water, they often mistake it for food or get tangled in it and die. The sad part is that the large majority of the trash in oceans and lakes is food containers, something that could be easily avoided if everyone did their part to avoid littering. Litter is also responsible for the death of one million birds and 100,000 marine mammals every year. Seabirds depend on the ocean as their main source of food, and in order to hunt fish, they need to be able to see them. With litter floating on the water, this is nearly impossible, and when they try, they are often entangled in debris, dying as a result. Have you ever read up on the life of sea turtles? It’s estimated that only one out of every thousand sea turtles survives to adulthood due to predators and other natural means. Litter only compounds this issue and is a major contributor to the endangerment of sea turtles, along with other human activity. Overall, littering has a huge impact on lakes and oceans and it’s not just harmful to fish and marine mammals, but it affects our comfort and safety. Oak Disposal is committed to promoting a clean and healthy environment for everyone with its commercial waste disposal. Contact us today to find out more about our trash collection services! We’ve already talked a lot about the services Oak Disposal offers and how they keep our community clean and healthy, but what are some other things you can be doing on a daily basis to play your part? Here are a few tips to make you feel better about the effect you have on the environment. You may not think about this often, but a lot of the things we buy can be bought as a recycled products. Take, for example, a bike. If you’re out looking for a new bike, your gut reaction is to go to the biggest brand name you can find to get a shiny new bike. Although this is tempting, it’s not the most environmentally friendly option. Think about it like adoption. If you go to a used bike store, all of those bikes have already been made and are looking for a home and someone to love and care for them. That’s where you come in. If you buy a used or recycled product, you’re taking and using something that would otherwise be sitting on a store shelf or left to gather dust in a warehouse somewhere. Avoiding driving for just two days a week will reduce greenhouse gas emissions by 1,590 pounds in a year. If everyone committed to this, we would take one large stride towards making our community a healthier and cleaner place. Each person in the United States uses about 80-100 gallons of water a day. That’s about a bathtub and a half full of water! Why do we use so much? Showers, flushing the toilet, washing our hands, the food we eat. Our drinking water is a very small portion of this, and that’s why we need to be extra conscious of the amount of water we use throughout the day. Oak Disposal Services is dedicated to protecting the environment and providing you with a great waste management service. Visit our website today to learn more about our residential trash pickup services and the areas that we serve! Hello, dear reader, and welcome back to the Oak Disposal Services blog. 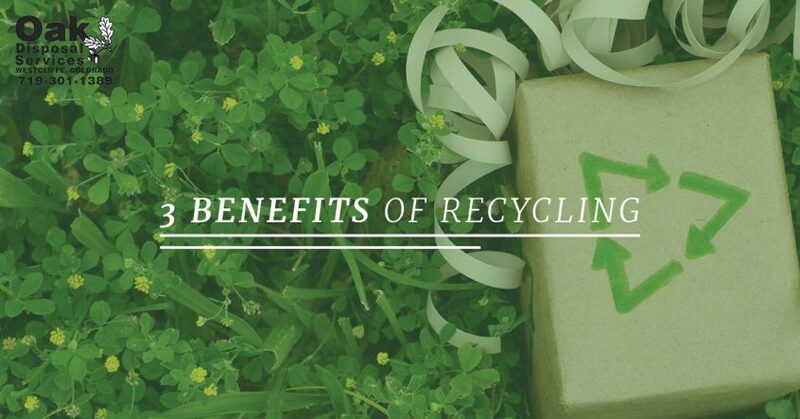 If you read our previous post, you already know that we are using this blog post to continue to list out some of the major benefits that are associated with recycling. If you haven’t read our previous post, welcome. While you don’t need to read our previous post to benefit from the information that is in this blog post, we recommend that you still go back and do so. However, if you’d like to jump right in and get to learning, that is totally fine too. 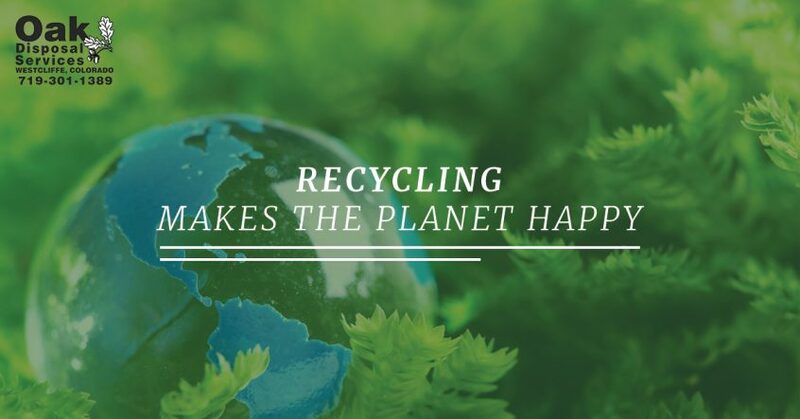 Continue reading below to learn more about the benefits of recycling and why you should make recycling a part of your waste management routine. If you have ever been to a landfill, you probably noticed just how big these smelly but essential facilities are. Studies show that the average person generates over four pounds of trash every single day and approximately 1.5 tons of solid waste per year. Americans alone are responsible for producing more than 200 million tons of garbage each and every year and, as our population increases, this number is only set to rise. With this much waste being produced each year, it should come as no surprise that many people are looking for a better way to reduce the amount of trash that is tucked into landfills annually. Once again, recycling comes to the rescue. Based on estimates from the Environmental Protection Agency, around 75 percent of waste produced by Americans is recyclable. Unfortunately, of this 75 percent, only around 30 percent of it is actually recycled. This means that 45 percent of the waste currently in landfills could and should have been recycled. So, the next time you are debating over whether or not you should recycle, just remember, there is only so much space for us to throw away our garbage; if we don’t take action now, we may run out of space sooner than we think. That’s right; by recycling, you can actually help to stimulate the economy! As greater emphasis is placed on more sustainable energy production and waste management, new jobs are becoming available at a rather brisk rate. While it might seem counterintuitive that recycling creates jobs (after all, if fewer goods are being produced due to recycling wouldn’t jobs be disappearing? ), the opposite is actually true. Recycling facilities require workers and, as more people recycle, more workers are needed. What’s more, jobs related to the recycling industry tend to pay more, on average, than traditional landfill jobs. Creating more high-paying jobs helps to stimulate the economy which, as we all know, is a good thing for everybody. It is a part of human nature to desire a better life for our children. Ask any parent and they will tell you that they want their children to live better lives than they did, have access to more resources, and find success. All of these things will be hard for future generations to accomplish if the planet continues to warm from greenhouse gasses. By choosing to recycle, people are choosing to leave a better planet to future generations, a planet that is clean and lush instead of hot and overrun with garbage. With concentrated recycling efforts, we can ensure that our planet is fit for another 1,000 years, a thing that we feel that majority of people on earth would like to see. When you choose to recycle, you are doing more than helping to reduce the amount of waste in landfills, you are helping to reduce the amount of waste on Earth. Barring a startling new discovery, we have one planet to work with and, in our opinion, it is a planet that is worth the effort to maintain. If you would like to learn more about recycling, the things you can recycle, or anything else related to the world of recycling, please contact us today at Oak Disposal Services. We have been offering recycling services and with trash pickup services to the greater Wet Mountain Valley for more than 20 years and we would love to have your business. Hello, and welcome back to our blog! Here at Oak Disposal Services, we are dedicated to providing the best waste removal and trash pickup services that we possibly can for the residents of Wet Mountain Valley. Proper waste removal is an essential component for a clean planet and, in today’s post, we are going to talk about one of our favorite waste removal topics: recycling. Recycling is beneficial in so many ways that we could spend days talking about how much we love it. However, we also understand that not everyone has the time to dedicate to the topic of recycling like we do, so we are going to limit our gushing to two posts. Continue reading below to learn more about the benefits of recycling. As we have grown as a society, our demand for energy has increased. Whether we want to admit it or not, energy consumption and energy demand are closer together than is comfortable for many higher ups and, rightly so, every developed nation on Earth looks for ways to either reduce energy consumption or find a way to produce more energy. Although gains in the energy sector have been great in the last few years, we are still coming to a point where we, as a country, have to find any and every way possible to reduce our energy consumption. Recycling is one of the easiest ways to accomplish this goal. When people recycle, they are reducing the amount of energy that has to be expended in order to produce goods, the amount of energy needed to harvest the raw materials for said goods, and reducing the amount of energy that is expended on landfill management. In today’s world of instant gratification and nearly endless consumer options, people often lose sight of the fact that every single product or good that is purchased requires a vast amount of resources to be used before it is placed on a store shelf. Even items that don’t require much in the way of manufacturing, such as fruits, vegetables, and other unprocessed food items, require resources such as oil, gas, and water to be grown and transported for sale. Recycling goes a long way to reduce the amount of resources that are used to produce goods. For example, recycling plastic greatly reduces the need for oil by products that are essential to the manufacturing process of plastic. Additionally, recycling helps to conserve other vital natural resources such as timber, water, and rare minerals. Unless you have been living under a rock for the past decade, you are probably aware of the fact that pollution is becoming an ever increasing concern the world over. While industrialization has allowed us our current standard of living, it has also caused harm to our planet that, if ignored, could have disastrous effects. Across the globe, temperatures are rising at an alarming rate and, if we do not curb our production of pollution, could result in an Earth that is less than hospitable to human life. Luckily, recycling is an easy and effective way to cut down on the amount of pollution that is produced. When people recycle, they are reducing the need to collect new raw materials for products. This means that recycling reduces the amount of fossil fuels burned in order to harvest, transport, and manufacture said goods. While recycling will not completely solve the issue of pollution in the world, it is a solid step in the right direction. Join us again next time as we continue to go over some of the greatest benefits of recycling and why you, as a citizen of the Earth, should take it upon yourself to make recycling a part of your lifestyle. If you are unsure how to start recycling, unsure of which items are and are not recyclable, or simply want to learn more about our recycling program, please contact us today. At Oak Disposal Services, we are dedicated to sustainable waste management and trash pickup services for the great Wet Mountain Valley area and we are certain that if you choose us as your trash service you will see what makes us one of the best services in the area.